Americans have embraced European duvets for good reason: it's a snap to make the bed and they're comfortable. 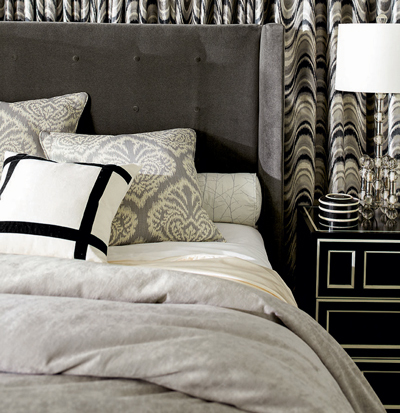 Add pillow shams and a bed skirt to complete your bed ensemble. Our custom duvets are reversible; consider using a quilted duvet cover alone in summer, then adding an insert for extra warmth in colder weather. Calico's duvet covers are reversible and decorative fabric is required for the face and back. Quilted comforters can be the frosting on the cake of a luxurious or a tailored bed - overhanging a bed skirt or platform base. Use two fabrics front and back for two distinctive looks. Place a custom comforter at the foot of the bed for extra warmth and color. Comforters are reversible. Decorative fabric is required for the face and the back of the comforter.